Search engines love blogs. They provide original, updated content that contribute to highly ranked sites. 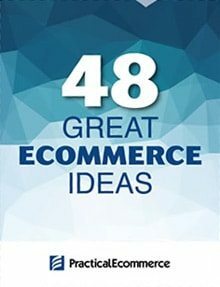 But how do merchants optimize blogs for search engines and how do they incorporate the blogs into their ecommerce sites? I’ll discuss optimizing blogs for search engine performance in this article. 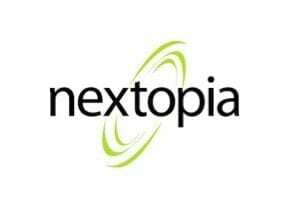 A blog presents a unique search-engine-optimization opportunity for ecommerce merchants in that it’s already — out of the box — search engine friendly. Merchants can leverage that fact and further optimize blogs with additional tweaks that are not hard to do. 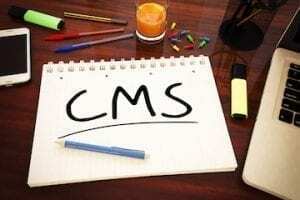 One way is to implement certain plug-ins and themes, or frameworks, which are either search engine-optimized or provide search engine optimization capabilities that are not available in the core blog platform. For example, I wrote a plug-in for WordPress called SEO Title Tag. It allows anyone to mass edit their title tags across their entire blog in one fell swoop. It has an edit interface that presents all of the blog post titles on one page. WordPress is an ideal platform for blogging, but you can also add a search engine optimal framework on top of that theme. Frameworks are like theme files on steroids. 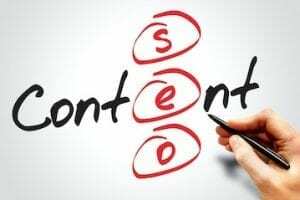 A theme or template normally is just thought of as something that applies a skin or design to your blog, but a really advanced theme will have a lot of capabilities built into it that help with search engine optimization. It’s referred to as a framework because it provides a framework for building off of in a way that’s very flexible, but has a lot of capability. 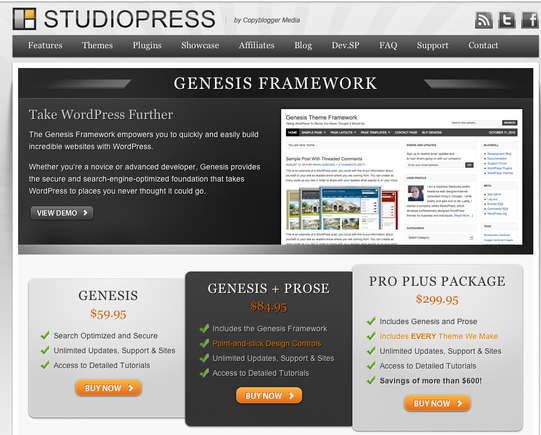 Thesis and Genesis are two of examples of WordPress frameworks. Genesis blog theme, for WordPress. Blogs occupy a special place in the heart of Google in particular, where they get additional love and rankings benefit over and above just a static, boring brochure or a website. One benefit to blogging is you get additional visibility in Google blog search, and then Google blog search results oftentimes gets syndicated into the main web results of through Google’s universal search. You can see news results, blog results, book results and so on, integrated into the main Google web results. So, having a blog gives you that additional visibility in Google blog search in the one box of blog results that often appear in the main web results. Another benefit is that, because of the way that a blog is structured, you get a very search engine friendly site just right out of the gate. A blog typically has really good HTML coding and good internal linking structure, which offer positive benefits in terms of SEO. A third benefit is that bloggers tend to link to other bloggers much more so than to a static brochure or to websites or ecommerce sites. People do business with people, and bloggers want to engage with other bloggers. By blogging, you can attract more links and be pulled into more conversations and be able to engage more easily in dialogue with other bloggers, which gets you more links from those blogs. 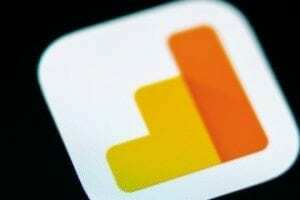 In my view, WordPress is the gold standard of blogging platforms. I also like b2evolution. Most of my blogs are running on WordPress, and I have b2evolution on my main personal blog. Both are very search engine friendly. b2evolution avoids many viruses and hackers. 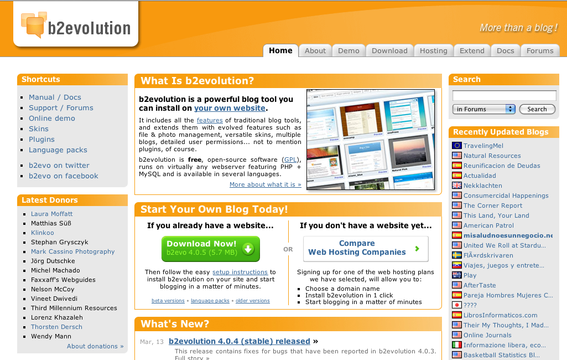 b2evolution is open source like WordPress, but not nearly as popular. That’s actually a good thing because b2evolution doesn’t get targeted by hackers anywhere near as much as WordPress does. With WordPress, you always have to keep on top of the latest security fixes and updates. If you let a few versions go by without updating, your blog can be taken over by hackers who can put hidden spam links and hidden redirects that siphon traffic away from your Google results; or get your blog to rank first for something you really don’t want to rank for, like maybe Viagra, and then diverting that traffic away to their own evil site. So, if you’re running WordPress, always keep up with the latest version and keep your plug-ins up-to-date. Or, use a more secure platform like b2evolution. 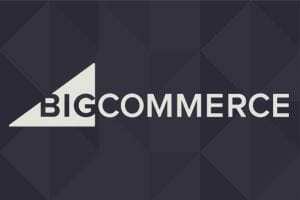 There are some blogging platforms that I would not recommend to ecommerce merchants for various reasons. One is Blogger.com, which is owned by Google. You might think that using the blogging platform owned by Google would help you rank really well on the Google search results, but it won’t because the Blogger platform is not very flexible. It doesn’t give you the same capabilities that WordPress or b2evolution do, like being able to install different kinds of plug-ins or tweak different aspects of the blog. TypePad.com is another platform I would not recommend because it’s not flexible, similar to Blogger.com. I also don’t recommend that you go with a platform that is hosted in a way that you have to use it’s — the platform’s — URL, such as the free version of WordPress.com. It’s very foolish not have your own domain name. If you have “mycompany.wordpress.com” or “mycompany.blogspot.com” or “mycompany.typepad.com” as your blog URL, it’s basically like going with an AOL email address back in the 1990s. You’re going to be bitten by that choice later on if you decide to switch platforms. So, pay the extra money to establish your own blogging URL. In most cases, it’s best to incorporate your blog into the main www subdomain of your primary domain name. 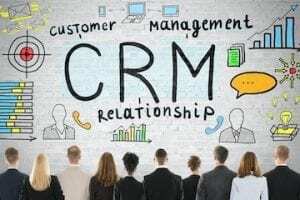 Assuming that you have really good content that’s worth linking to, people will link to your various blog posts, and having those links on the same subdomain as your ecommerce site gives you maximum benefit in terms of the flow of link authority and domain authority from those inbound links into your ecommerce shop. If it’s compelling content that’s not just sales copy, and if you think that it’s not going to detract from the link-worthiness of the content, and if it’s on your main site, then go for it. Listen to the complete discussion with Stephan Spencer on the SEO importance of blogs. There are cases, however, where it makes more sense to put your blog at arm’s length because it might otherwise seem like a shill for your company. If you think that it’s much more link-worthy to have your blog on a separate subdomain, or even a separate domain name, then that’s worth considering. Just bear in mind, however, that putting your blog on a brand new domain name begins with no authority, trust or importance in the eyes of Google. You’re going to have to build that up over time, and you’re not going to rank well on Google for a number of months. On the other hand, if it’s a new subdomain of your main domain, you’re going to have much easier time of building up that authority. Your blog rides on the coattails of the authority of your primary domain name and with the brand new subdomain. One of my favorite merchant blogs is actually a long-time client of mine, Steve Spangler. His company is called Steve Spangler Science. He’s like Bill Nye the Science Guy in that he’s built quite a reputation as a science educator, and a man who invents science toys and does lots of science experiments on TV. He founded an ecommerce company and he’s also an educator, a science teacher, and a keynote speaker. 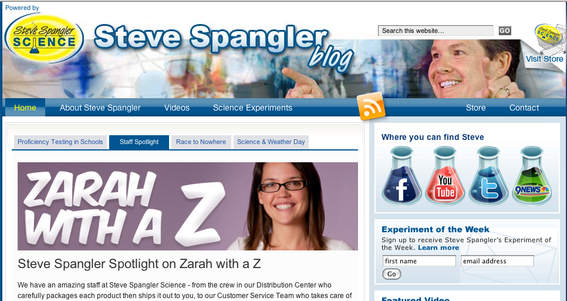 Spangler created a CEO blog at a separate domain name at Stevespangler.com. The blog does a soft sell from that site onto his ecommerce site. It’s not all just a shill for his company. He does a really nice job of walking that line by including valuable, rich content and lots of YouTube videos and other social media, such as Twitter and Facebook. SteveSpangler.com "soft sells" the ecommerce site. An essential ingredient to success is to really have personality in your blog. Have your bloggers introduce themselves in the blog through an “About” page, and have a photo and a little bio of each of your bloggers on the blog’s homepage with a link to read more. This allows readers to very quickly get a sense of who’s behind your blog, and it lets them know that it’s not just some faceless corporate entity that’s blogging; these are real human beings. Do this and you’ll get more links and people will be more inclined to comment and connect with you. Also, try to inspire people to comment on your post. Engage them in a dialogue, and ask them to chime in with additional tips or suggestions or ideas. Don’t just get up on your soapbox and talk without expecting to engage in dialogue. If you’re not blogging, you’re missing a huge opportunity. 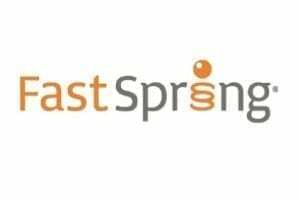 Start by signing up with a free blogging service such as WordPress.com. Pay the $18 a year fee to get your own domain name associated with your blog. Start it as a personal blog so you can experiment and get comfortable with blogging. 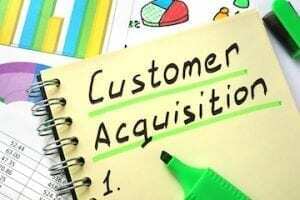 Then, as you gain more comfort with it, start experimenting with a company blog or ecommerce-related blog.